To detect injuries with our cell-free device, we employed three enzymes which commonly used in diagnosis to realize enzyme cascade and logic gate. Meanwhile, we found that SpyTag forms a spontaneous isopeptide bond to SpyCatcher, and SdyTag/SdyCatcher, SnoopTag/SnoopCatcher are the same. With no cross reaction, three orthogonal tag-catcher pairs link enzymes in order via covalent bond. The table of best part collection is shown below. We constructed three biobricks of tag-functional protein-catcher complex which can spontaneously assemble via covalent links. The original DNA sequence comes from the references below. To realize RFC10 compatibility and correct expression in high level, we optimized and synthesized the sequence, and mutated some illegal Restriction Enzyme cutting sites through synonymous substitutions. 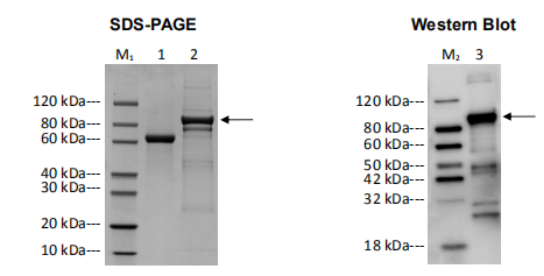 We utilized SDS-PAGE and Western blot to detect the expression of the three tag-protein-catcher complex. The primary antibody is Mouse-anti-His mAb. Fig. 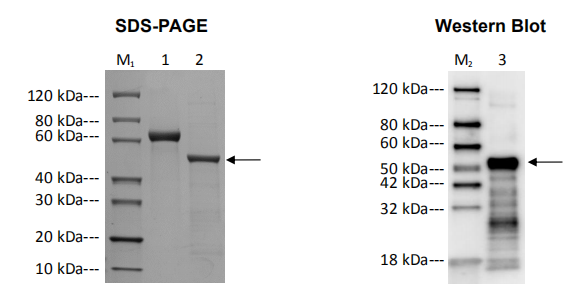 2 SpyCatcher-LDH-SdyTag| (A) SDS-PAGE, Lane M1 is protein marker, Lane 1 is BSA (2.00 µg), Lane 2 is SpyCatcher-LDH-SdyTag. (B) Western Blot, Lane M2 is protein marker, Lane 3 is SpyCatcher-LDH-SdyTag. Fig. 3 SdyCatcher-HRP-SnoopTag| (A) SDS-PAGE, Lane M1 is protein marker, Lane 1 is BSA (2.00 µg), Lane 2 is SdyCatcher-HRP-SnoopTag. (B) Western Blot, Lane M2 is protein marker, Lane 3 is SdyCatcher-HRP-SnoopTag. Fig. 4 SnoopCatcher-GOx| (A) SDS-PAGE, Lane M1 is protein marker, Lane 1 is BSA (2.00µg), Lane 2 is SnoopCatcher-GOx. 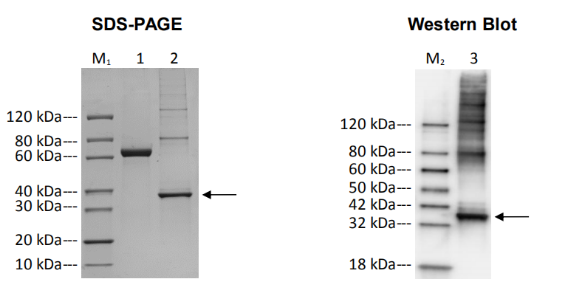 (B) Western Blot, Lane M2 is protein marker, Lane 3 is SnoopCatcher-GOx. Besides, we used BSA Standard Curve to qualifity . Because the three complex didn' t express out successfully at the same time, so we tested their concentration separately and made BSA Standard Curve for each one. Fig. 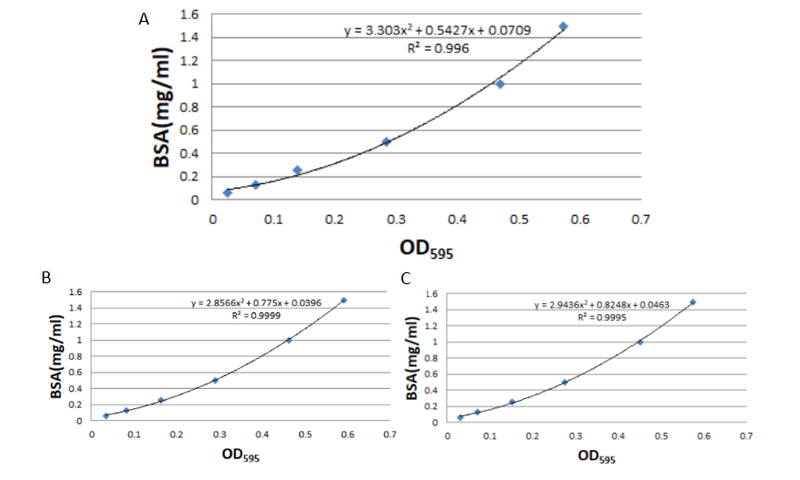 5 Standard curve for Bradford assay|(A) for SpyCatcher-LDH-SdyTag analysis; (B) for SdyCatcher-HRP-SnoopTag analysis; (C) for SnoopCatcher-GOx analysis. We suspected that the fusion with Tag/Catcher might lead to enzyme activity decline which had certain influence on our detector. To verify and qualify the enzymes' activity decline, microplate reader was used. The result shows the effect of Tag-Cather on enzyme activity can' t be underestimated. How to improve the modified enzymes' activity is the focus in our future work. Fig. 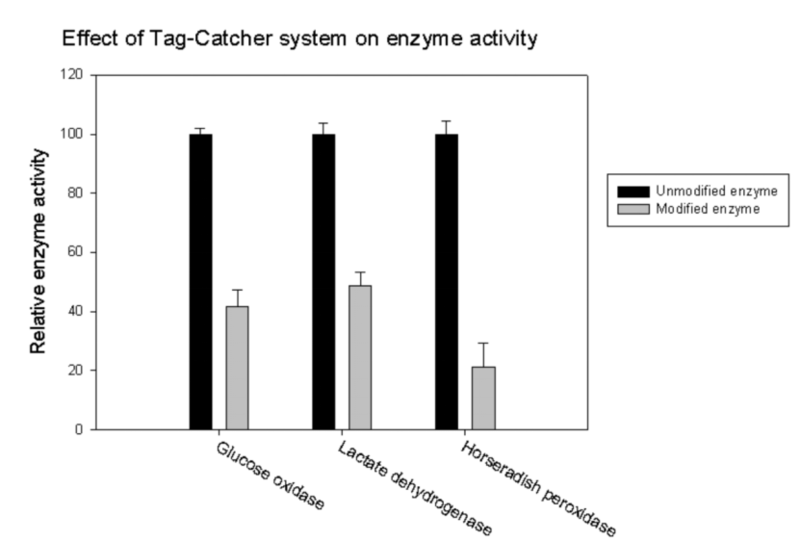 6 Effect of Tag-Catcher system on enzyme activity. Zakeri (B) Fierer JO, Celik E, Chittock EC, Schwarz-Linek U, Moy VT, Howarth M. Peptide tag forming a rapid covalent bond to a protein, through engineering a bacterial adhesin. Proc Natl Acad Sci U S A. 2012 Mar 20;109(12):E690-7. Veggiani G, Nakamura T, Brenner MD, Gayet RV, Yan J, Robinson CV, Howarth M.Programmable polyproteams built using twin peptide superglues. Proc Natl Acad Sci U S A. 2016 Feb 2;113(5):1202-7. Tan LL, Hoon SS, Wong FT. Kinetic Controlled Tag-Catcher Interactions for Directed Covalent Protein Assembly. PLoS ONE 11(10): e0165074. J Fang, WB Zhang. Genetically Encoded Peptide-protein Reactive Pairs. Acta Polymerica Sinica 2018 Jan (4):429-444. J Halamek, JR Windmiller, J Zhou, MC Chuang, P Santhosh,G Strack, M A. Arugula, S Chinnapareddy, V Bocharova, J Wang, E Katz. Multiplexing of injury codes for the parallel operation of enzyme logic gates. Rakitina D.V., Baikova J.P., Ladygina,V.G., Manolov,A.I., Kanygina,A.V. Investigation of E. coli samples isolated from patients with Crohn's disease. Liu Y. Cloning and High Efficiency Expression of Glucose Oxidase from Aspergillus niger. Edwards,R. SYNTHETIC GENE. British Bio-Technology Ltd.